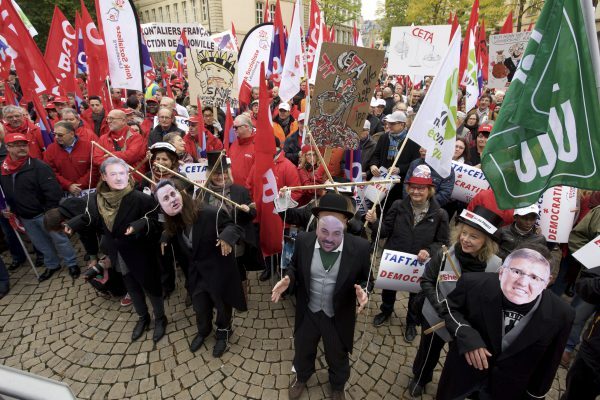 More than 4,000 people gathered in Luxembourg City on Saturday morning to protest against controversial free trade agreements CETA and TTIP. The demonstrators responded to the call of the “Stop TTIP” platform, which has been critical of both agreements being negotiated by Canada and the US with Europe, and especially their lack of transparency. “It cannot be that big corporations dictate everything,” Jos, one of the more senior participants said. “What is happening behind closed doors is a scandal. This is undemocratic. The autonomy of the countries is simply being undermined,” Doris and Sophie said. The "Stop TTIP" platform, which warned CETA is against he interets of citizens and the country, has called on the Luxembourg government to suspend ratification until all of its questions have been resolved adequately. But time is running out: the CETA agreement is due to be ratified on October 18 at a Council meeting of EU Ministers.